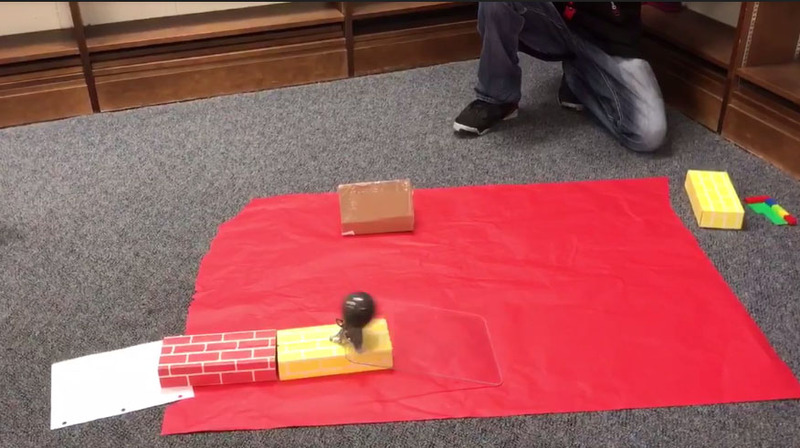 In this lesson, students in Mrs. Carpenter-Jones self-contained English 11 course created obstacles that represent challenges faced by the protagonist in the novel The First Part Last and then coded the Sphero robots to navigate obstacles. First, students predicted the problems a teen parent might face and discussed problem-solving strategies. After developing an understanding of those challenges, students created a physical obstacle to overcome (using the Sphero robot) and drew parallels between this obstacle and the potential challenges of being a teen parent. Then using their knowledge of block coding, students programmed the Sphero robot to navigate those obstacles. Finally, students reflected on the challenges they faced in creating obstacles and programming the Spheros. After, students connected their experiences overcoming challenges to the characters experiences as they read The First Part Last. This activity empowered students to use many different skills (problem solving, collaboration, innovation) to symbolize what the character from the book might be feeling through using a Sphero and building an obstacle course. The students enjoyed using technology that was not conventional to an English classroom. Rating: Developing – Explanation: To successfully build an obstacle course and navigate their Sphero through the course, students worked in self-chosen groups. But because the classes are all small (fewer than 9 students) the class worked as a larger group to discuss challenges and problem solving techniques through the use of Schoology discussion boards provided by the teacher. Rating: Ideal – Explanation: Critical thinking was stressed as students learned how to work a Sphero and then applied those skills to moving it through their created course. Students also had to understand symbolism and representation in order to build a course that represented the character from the book. This lesson emphasizes problem solving as students were challenged to constantly re-evaluate their progress in order to reprogram their Sphero or adjust their course in order to succeed. Students spend time reflecting on their critical thinking and problem solving experiences with coding the Spheros and what it took to be successful then made connections to the characters experiences in the novel. Beyond that, students were challenged to evaluate how they face challenges in their own life and what future adjustments to their actions might be beneficial. Problem solving takes patience and perseverance which was a focus during this activity. Rating: Approaching – Explanation: Students were able to create original obstacles that represented their own ideas about the character’s life challenges. Then students were able to create solutions through coding that successfully navigated their robot around the obstacles. Students needed to apply their critical thinking and reflection skills to continue to edit and modify their obstacles and solutions to this simulation of an authentic task. eldaniel - who has written 4 posts on Henrico 21.